Each year, millions of birds come to Nicaragua from the north, stay for several months, and then head northward again to nest. Their existence is treacherous, depending on excellent navigation skills, luck in weather patterns, and finding and maintaining adequate habitat at each end of the journey, year after year. Perhaps a quarter of the more than 700 bird species found in Nicaragua only spend part of their year in Nicaragua. 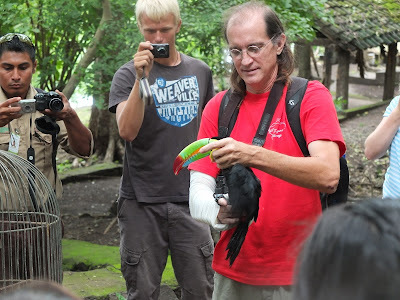 Many of these birds spend a substantial part of their lives in Laguna de Apoyo Nature Reserve. Tennessee Warbler (Oreothlypis peregrina) in Laguna de Apoyo. Photo by Pier-Olivier Beaudrault. Some of these birds are seen as early as August, but most are first seen in late September. The forest is different with these birds present, for sure, because there are simply more birds than before. New arrivals are sometimes quite easy to detect, because the birds are tired from a long and arduous journey. The new arrivals may move sluggishly and less cautiously, and stay lower in trees while resting and recovering. Many don't survive the journey and the adjustment to the new environment with all its new threats and challenges. We have often wondered what the resident birds must think to find their habitat more filled than ever with new birds arriving from afar. Within weeks, the forest population seemingly doubles, with birds that probably have to be more active to survive, because they are the new kids on the block. After lots of rain, the forests are burgeoning with fresh vegetation and new flowers. The insects, nectar and fruits provide a feast for resident and migratory birds, alike. Great Crested Flycatcher (Myiarchus crinitus) in Laguna de Apoyo Nature Reserve, Nicaragua. Photo by Pier-Oliver Beaudrault. 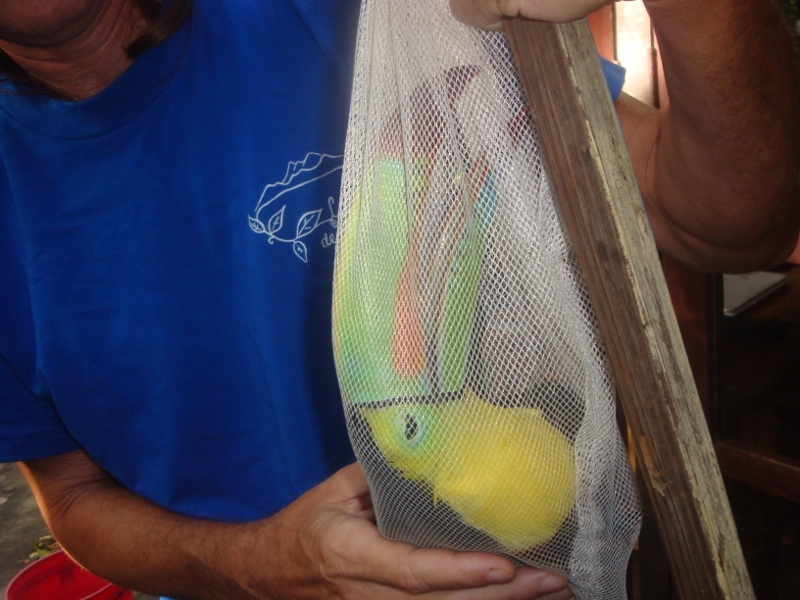 We often catch migratory birds during our studies using mist nets. 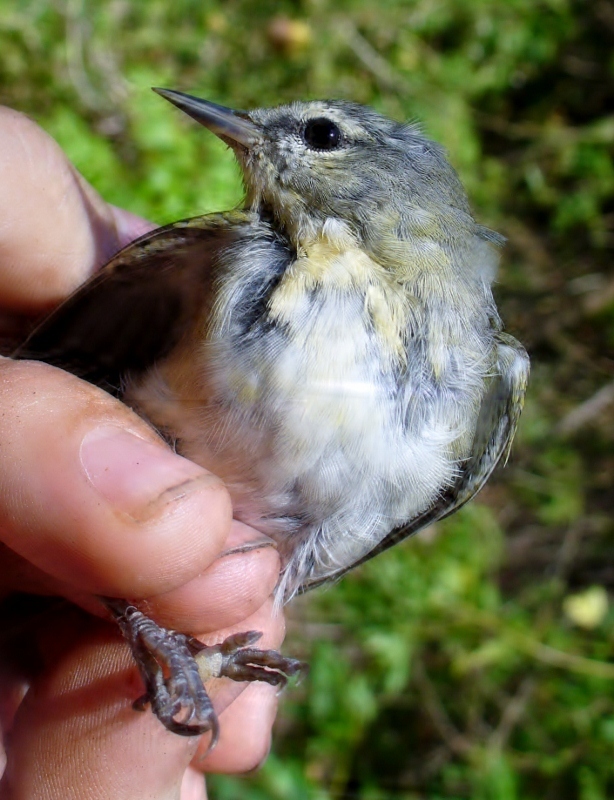 Most of the catches are passerines (Order Passeriformes). Many of the passerines in North America are what we call songbirds (clade Passeri), which have vocal chords developed for unique and melodious songs. The Tennessee Warbler (Oreothlypis peregrina) is a common bird in our nets and in the forest canopy of Laguna de Apoyo Nature Reserve, too. The bird nests much further north than Tennessee, so Tennessee Warblers spend only hours or at most, very few days in that state. Perhaps it should be called the Nicaragua Warbler! 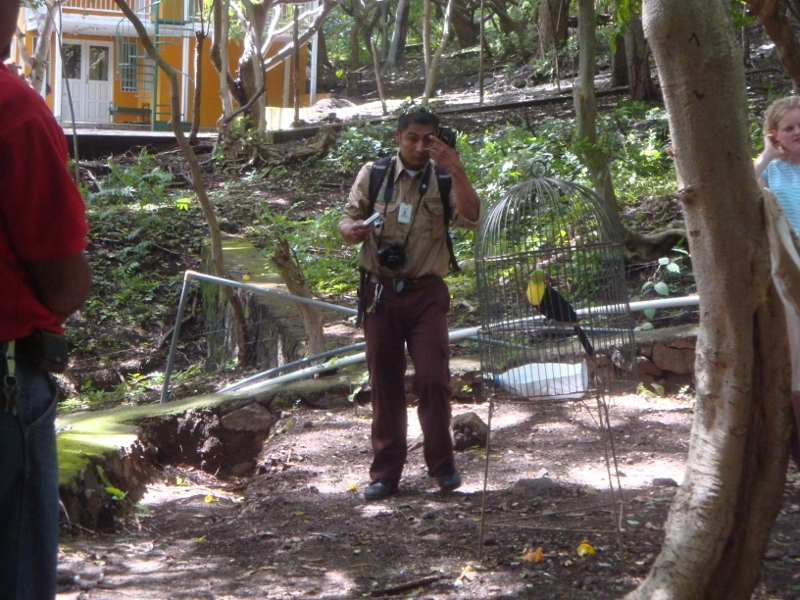 Like almost all migratory songbirds, however, the Tennessee Warbler does not sing while in Nicaragua. It produces a weak, monotonous chip while in its southern home. It usually is found in a loose flock with other insectivorous birds, feeding on arthropods on the undersides of leaves in medium and tall trees. The Great Crested Flycatcher (Myiarchus crinitus) is a migratory bird from the other major passerine division, the flycatchers and similar birds (clade Tyranni). 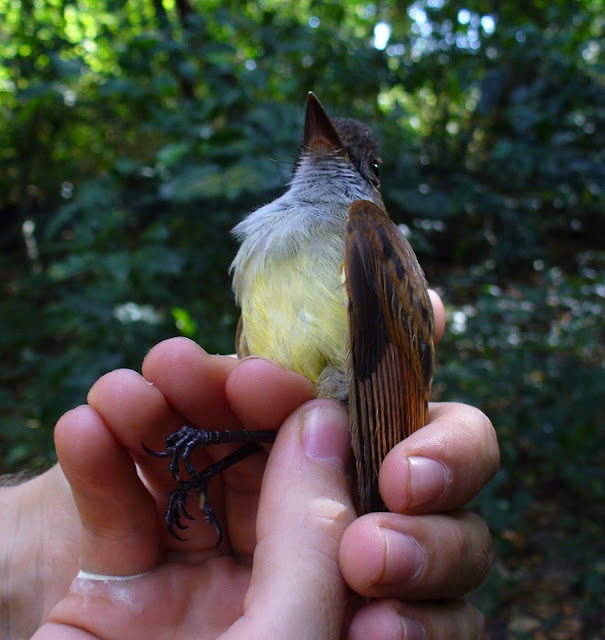 Whereas more songbirds found in Laguna de Apoyo Nature Reserve are migratory than resident, the majority of the flycatchers are residents, and several other very similar flycatchers of the same genus, Myiarchus, are found in Laguna de Apoyo Nature Reserve. 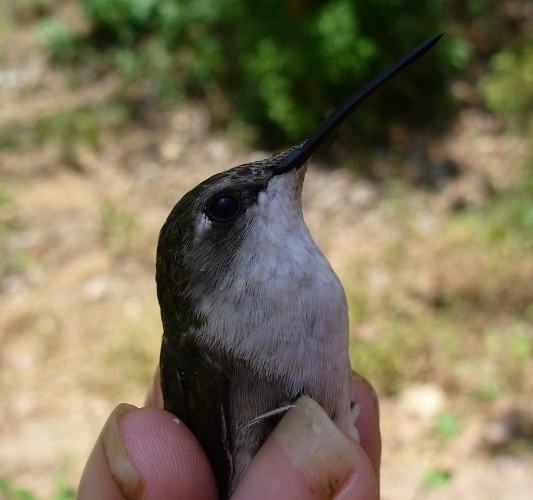 The phenomenon of seasonal migration in birds is amazing, more so in the tiny Ruby-throated Hummingbird (Archilochus colubris). Photo by Pier-Oliver Beaudrault. Hummingbirds are always everyone's favorite birds. Most of North America is inhabited with only a single hummingbird species, whereas ten can be found in Laguna de Apoyo Nature Reserve. There are plenty of hummingbirds year round for the birdwatcher, but sighting a Ruby-throated Hummingbird (Archilochus colubris) is always comforting. Such a small bird making such a long trip, twice each year, seems improbable, but we see them each year, and many are captured during mist netting. 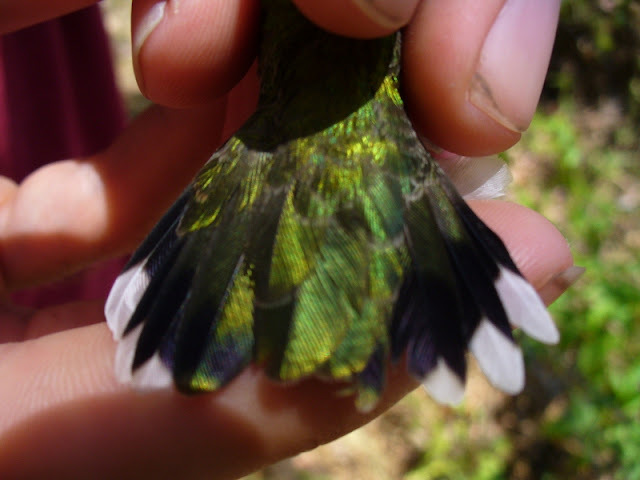 The characteristic tail pattern in the Ruby-throated Hummingbird (Archilochus colubris) helps identify it in the field. Note the clipped leftmost rectrice (tail feather), to demonstrate the bird has been previously captured. The mark should last until the bird's next molt. Photo by Pier-Oliver Beaudrault. The great northern bird migration coincides with flowering of many plants in Mesoamerica, and this is not a coincidence. By January, many flowers can be found in forests and fields in Nicaragua. Most migratory birds are not spending their entire winter season in a single spot, but rather, following the flowers and fruits as each tree peaks. Migratory birds tend to flock in their southern range and their distribution is patchy, concentrated near trees with food for them or for the insects upon which they feed. Female Indigo Bunting (Passerina cyanea). Photo by Pier-Oliver Beaudrault. Not all migratory birds eat insects and fruit. Lots of birds which inhabit our seas and shores migrate latitudinally. Other land birds consume small seeds, especially the sparrow-like birds. 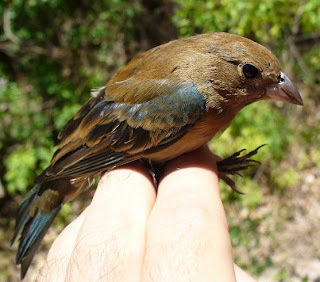 The Indigo Bunting (Passerina cyanea) is far less common than the Painted Bunting (Passerina ciris) in Laguna de Apoyo, perhaps partly because we are closer to the southern end of its southern range. We also have noted that the Indigo Buntings we have sighted and captured are almost all female. In many species, males and females migrate differently and reunite once on their northern territories. 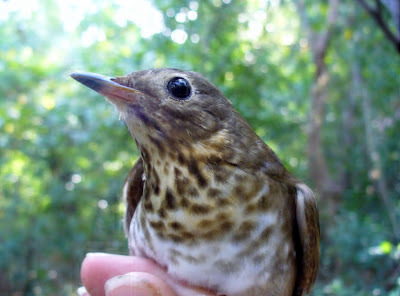 Swainson's Thrushes (Catharus ustulatus) are deceptively common in Laguna de Apoyo Nature Reserve, turning up often in mist nets during their southern season. Photo by Pier-Oliver Beaudrault. The resident Clay-colored Thrush (Turdus grayi) is abundant in Laguna de Apoyo Nature Reserve, but other thrushes may be found here during migration. The ebullient resident birds tend to distract the birdwatcher from the migratory Swainson's Thrush (Catharus ustulatus). We capture them far more than we expected, based on birdwatching observations. Like many migratory birds, the Swainson's Thrush does not sing most of its time in the south, although a beautiful song might be heard as they begin their northward journeys. 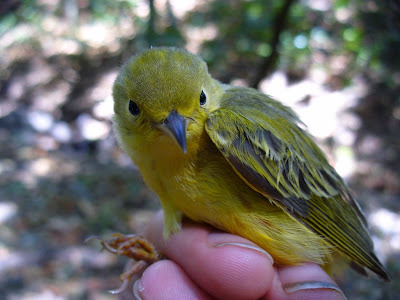 The most abundant migratory bird in Laguna de Apoyo Nature Reserve is the Yellow Warbler (Dendroica petechia). Photo by Joe Taylor. The most common and typical of the migratory passerine birds in Laguna de Apoyo Nature Reserve is the Yellow Warbler (Setophaga petechia). 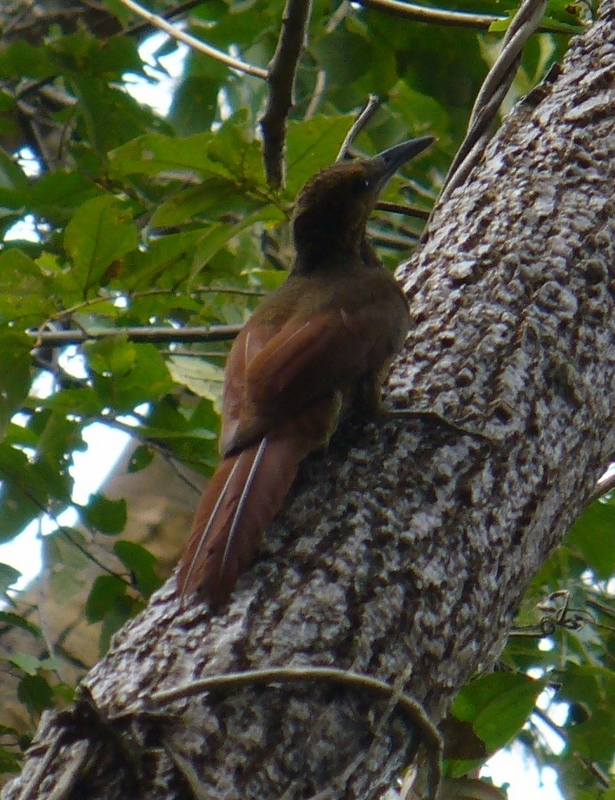 The tropical dry forest ecosystem of western Nicaragua is prime southern habitat for this bird. It occupies the outer portions of trees from high to low, moves rapidly, and repeatedly emits a loud, sharp chip. Other birds seem to flock around it. Where they are found, other, less obvious birds might be lurking, so a birdwatcher always likes to seen them. 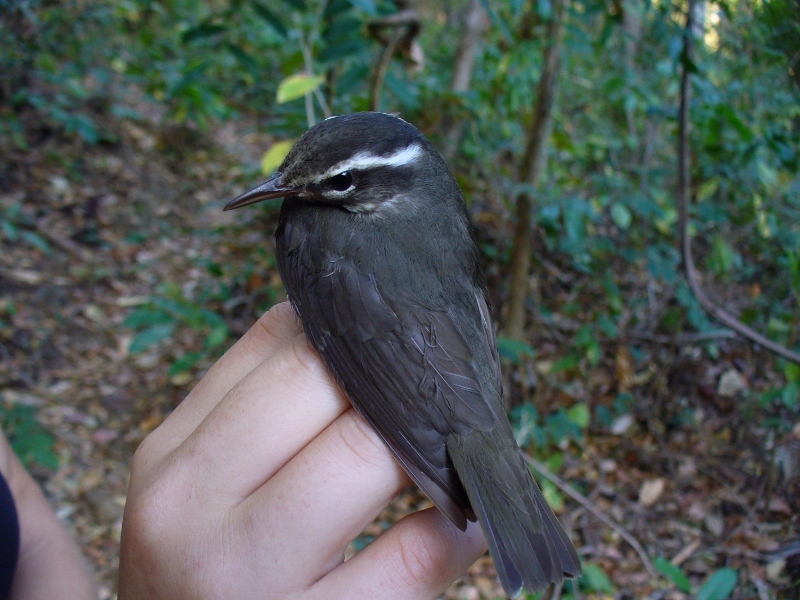 The Louisiana Waterthrush is uncommon and local to wet areas. Photo by Pier-Oliver Beaudrault. A lurking warbler which acts more thrush-like is the Louisiana Waterthrush (Parkesia motacilla). Like many more species, it is present in low numbers, so it is not seen just any day in any place. It is not so easy to distinguish it from its sister species, the Northern Waterthrush (Parkesia noveboracensis). This species is thought to be in decline due to elimination of habitat through channelization of streams and draining of swampy areas. The birds of Nicaragua are diverse and, in many natural areas, abundant. Many of them are only found in forests, never in gardens or towns. Woodcreepers (Family Dendrocolaptidae) are examples of birds which do not prosper in areas with much human impact. 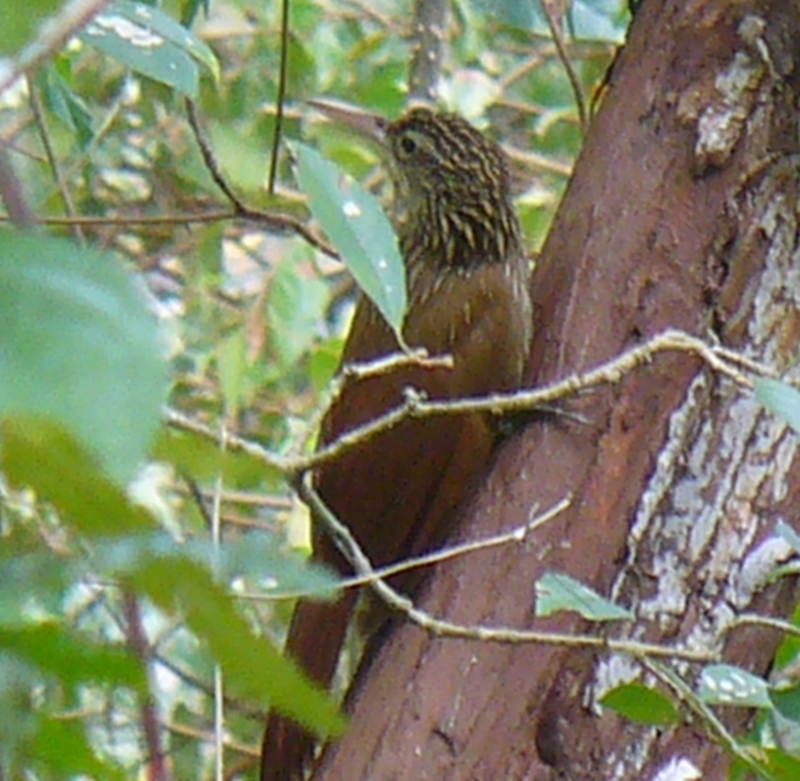 Several woodcreeper species can be found in Laguna de Apoyo Nature Reserve, but only in areas where human influence is limited. Ivory-billed Woodcreeper (Lepidocolaptes flavigaster) in Laguna de Apoyo Nature Reserve, Nicaragua. Photo by Pier-Oliver Beaudrault. The woodcreepers crawl along the trunks of trees similarly to woodpeckers. All of them have a rufous-brown base color, some are quite similar. They use their tails for leverage against the tree trunks, and seek invertebrates on and within the bark. The Ivory-billed Woodcreeper (Xiphorhynchus flavigaster). Photo by Pier-Oliver Beaudrault. A rising and falling, almost hysterical laughing call may be heard when the Ivory-billed Woodcreeper (Xiphorhynchus flavigaster) is near. Its strong relatively straight bill distinguishes it from the Streak-headed Woodcreeper, also present here. 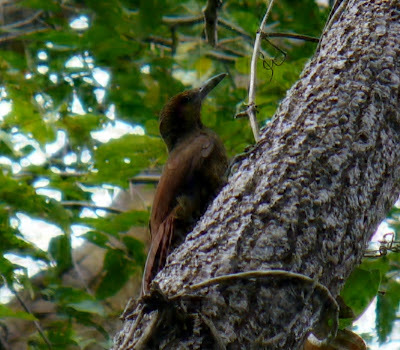 The Ruddy Woodcreeper (Dendrocincla homochroa) climbing Spondias mombin. Photo by Pier-Oliver Beaudrault. It is easier to identify on sight the Ruddy Woodcreeper (Dendrocincla homochroa), because it is uniquely uniform in color. It is not at all common, however, and we have seen it in Laguna de Apoyo Nature Reserve only a few times. It is known to follow army ant columns, preying upon animals that try to escape the path of the ants. Ruddy Woodcreeper (Dendrocincla homochroa) in Laguna de Apoyo Nature Reserve, Nicaragua. Photo by Pier-Oliver Beaudrault. 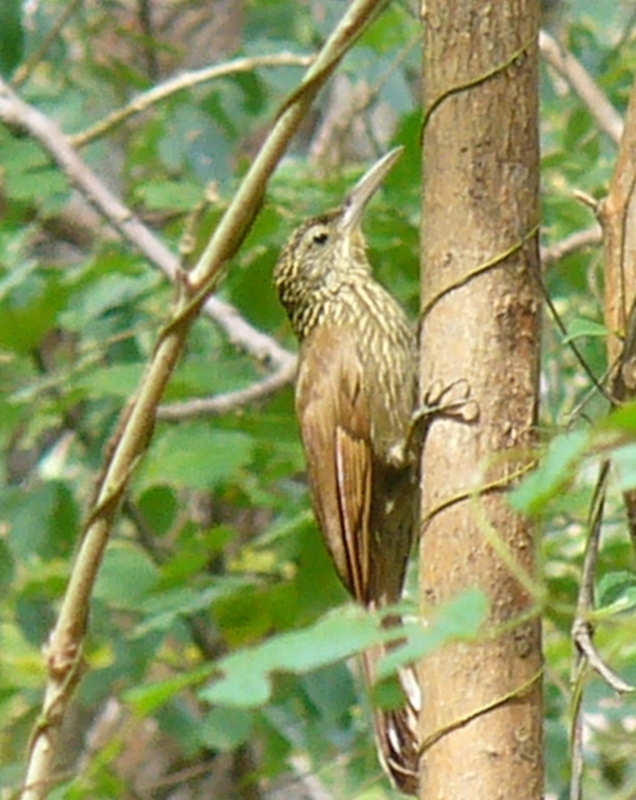 The woodcreepers are all limited to certain parts of the forest in Laguna de Apoyo Nature Reserve. No woodcreepers are found in the northern section of the reserve, where Estacion Biologica is located. The forest is considerably older and trees are bigger to the south and the west of the lake, where woodcreepers are common. Ruddy Wooodcreeper (Dendrocincla homochroa) is entirely ruddy colored, in constrast to other woodcreepers in Nicaragua. Photo by Pier-Oliver Beaudrault. Woodcreeper tails are utilized to sustain the birds and to provide leverage when digging in bark. Photo by Pier-Oliver Beaudrault. We were more surprised to sight, and eventually to capture during mist netting, the Northern Barred Woodcreeper (Dendrocolaptes sanctithornae), a bird supposedly limited to the humid tropical forests of the Caribbean side of Nicaragua. Like the Ruddy Woodcreeper, it is expected at ant-swarms, where it may feed nearly exclusively. As a darker, less colorful bird, with sluggish movements, it might go unnoticed by the birdwatcher. 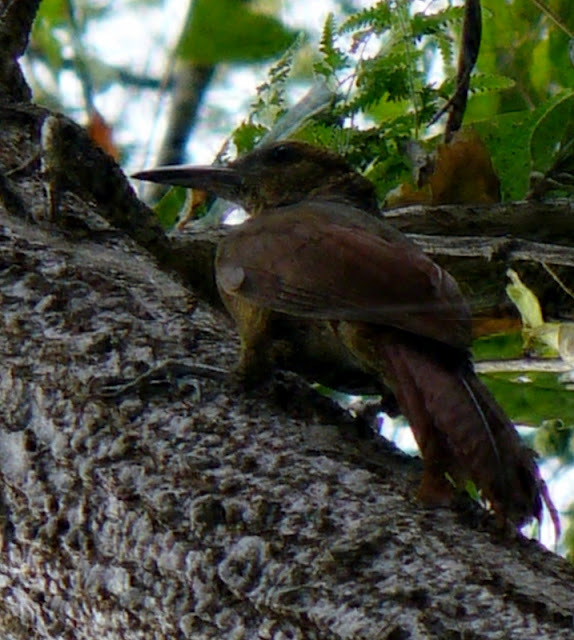 The tail feathers of the Northern Barred Woodcreeper (Dendrocolaptes sanctithornae) have strong central shafts which aid in propping the bird when perched on vertical stems. Photo by Joe Taylor. Woodcreepers make a special sighting for most birdwatchers, because they are not found in North America, and because they act differently from most other birds. Identification can be very difficult, however. We are especially happy when one ends up in our mist nets, although that means someone is going to get pecked a few times, as they are aggressive. 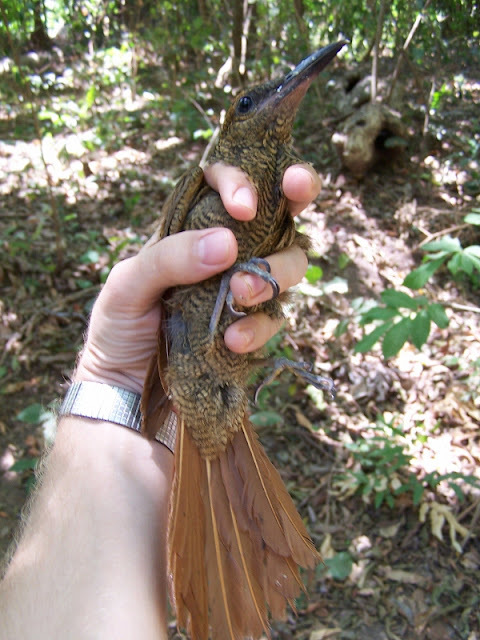 The Northern Barred Woodcreeper caught during mist netting in Laguna de Apoyo Nature Reserve, Nicaragua. Photo by Joe Taylor. 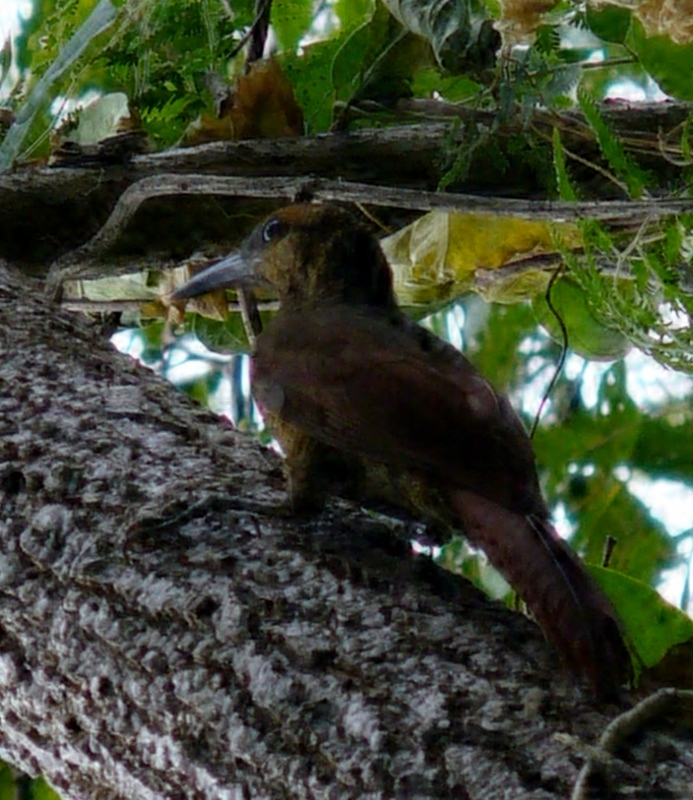 Woodcreepers are part of the conservation story in Laguna de Apoyo Nature Reserve, too. We are hoping that soon woodcreepers will be sighted on the north side of Lake Apoyo, because the forest quality in that area has improved steadily in the past several years. Go birdwatching with us! Wild animals should live and die in the wild, and not in cages. Photo by Gordon Evans. October 4 marked World Animal Day. When we think of animals, we usually think most of dogs, cats, other pets, or perhaps of cows and other food animals. 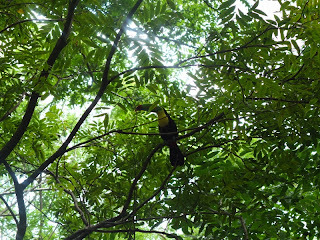 There are some awesome animals who have not co-evolved with humans, however, many of them in the jungles of Nicaragua! One of them is the Keel-billed Toucan (Ramphastos sulfuratus). Several months ago, we were entrusted with the care of Tookie, the now-famous bird who has been a pet for some years. 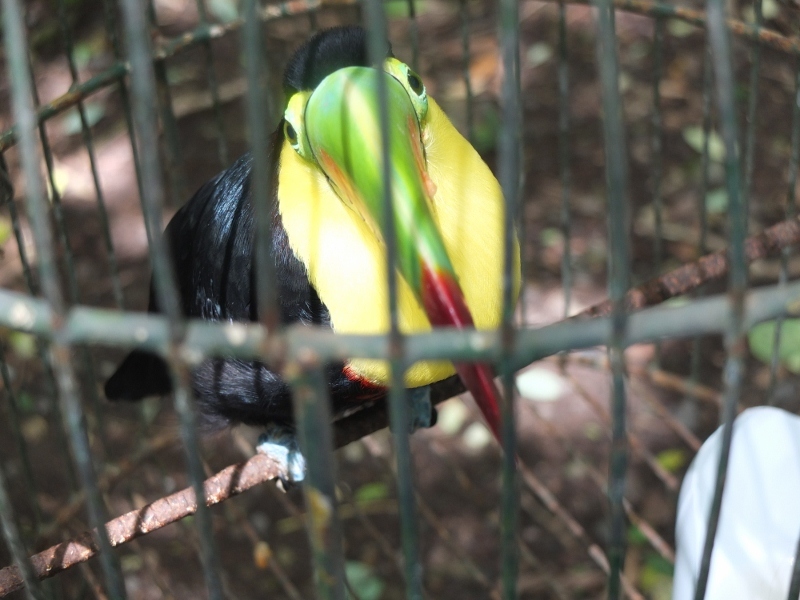 Tookie the Keel-billed Toucan in his enclosure in Estacion Biologica. es. he is the kind of bird depicted on the Froot-Loops box. Tookie has waited patiently for his time to fly free, and we coordinated his liberation date to coincide with World Animal Day. We worried, however: Would he fly away, or just come back? Would he find food and shelter, or starve immediately? 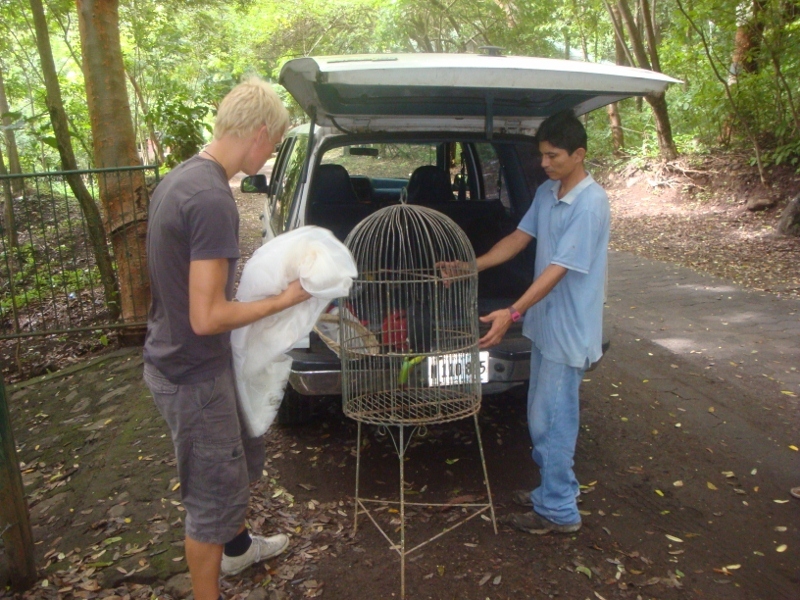 Tookie has been caught and is being placed in a cage for transport to the liberation site in Laguna de Apoyo Nature Reserve. Photo by Pablo Somarriba. We knew that Tookie was not hatched in captivity, however. He has a broken toe which surely came from his capture. He started his life in the wild, and we wanted to see that he end it in the wild, too. Jeffrey removed his splint to retrieve Tookie from the enclosure! Photo by Pablo Somarriba. The Keel-billed Toucan eats mostly fruit, and Tookie was prepared for his life in the wild by finding lots of nancites (Byrsonima crassifolia), tiguilotes (Cordia dentata), jobos (Spondias mombin), wild papaya (Carica papaya), and chiles (Capsicum annuum). Hopefully, he has learned some of the fruits to seek in the forest. Tookie became nervous when first placed in the cage to transport him to the liberation site. Photo by Pablo Somarriba. Even for a toucan, Tookie is a gorgeous bird. He has amazingly vibrant colors. He is also particularly well-mannered, for a toucan. Toucans do not usually take well to life in captivity, and they often become very mean. They often die from the diet provided them in captivity, because they can not eat just anything, as do other birds such as parrots. Keel-billed Toucans are relatively common in parts of Laguna de Apoyo Nature Reserve. Tookie relaxed once his cage was placed in the vehicle and was covered. Photo by Pablo Somarriba. The transportation to Tookie's liberation site went easily. 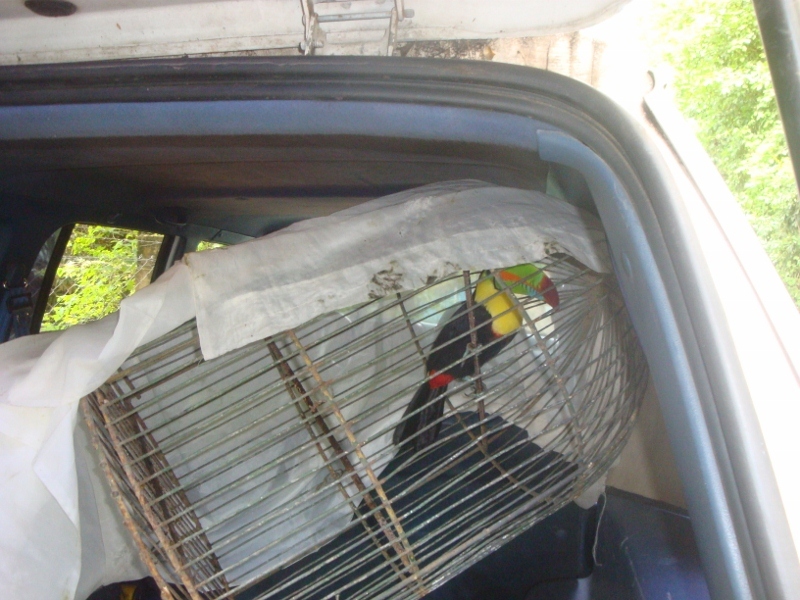 Once he was placed in the small cage and loaded into the car, he felt at ease. He was left an hour in the cage on the grounds, where he could assimilate his new surroundings above. He had already become accustomed to the forest around him, because his pen at Estacion Biologica was ample with views above and all around, and even has a fig tree growing inside it. His enclosure was very natural, but still restricted, and he wanted to be free. Dennis helps Elmer unload Tookie from the car. Photo by Pablo Somarriba. The site for Tookie's liberation was carefully chosen. Keel-billed Toucans are not frequently observed near Estacion Biologica, but they are common on the western side of the lake. We learned that Tookie likes water very much, and he would drink fresh water every day. He also loved to take baths, and he even liked the rain. His liberation site was chosen, in part, because water is near, and other toucans are always found in the area. Vera takes another look at Tookie before he goes free. Photo by Pablo Somarriba. The Masaya Delegation of the Ministry of Natural Resources organized our little event, which included participation from the Procuraduria (the Public Defense office) and the Ministry of Education. 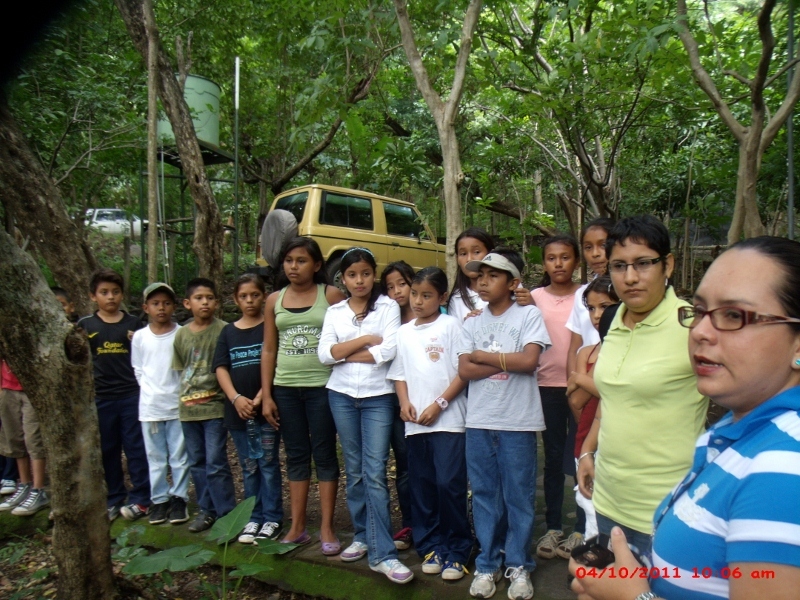 Students attended from the Escuela Luis Alfonso Velasquez which is located inside Laguna de Apoyo Nature Reserve. 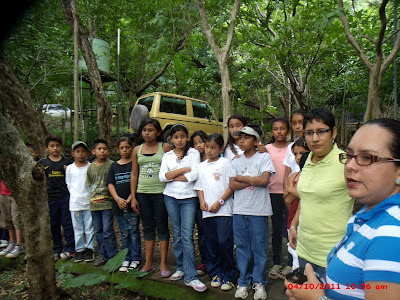 And the volunteers from Movimiento Ambientalista Guardabarranco in Masaya came, and our staff, interns and volunteer group, too. Tookie's return to the wild was well-attended, so we were even more nervous. What if he does not want to go to the forest? Laguna de Apoyo Ranger Dani Nicaragua helped to document the event. Photo by Pablo Somarriba. Our message in this event was simple: Wild animals should life free, not in cages. 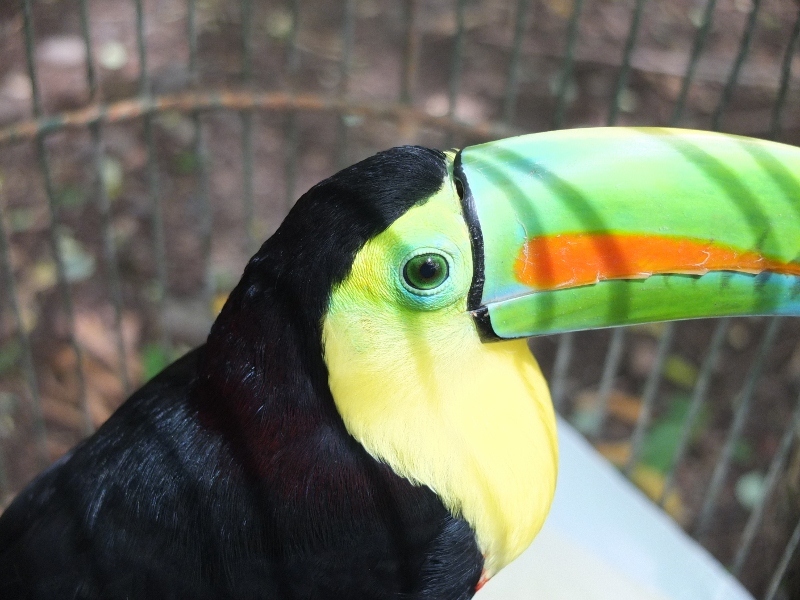 Tookie is a beautiful bird, and well-behaved (for a toucan! ), but he was not born in captivity and will never be completely tame. Toucans are not like dogs; they did not co-evolve over millenia in the intimate presence of humans. They don't even make good pets, because they don't show much affection, they are usually even mean, and they have specific dietary needs that are not easily met in captivity. Most toucans in captivity die unnecessarily. Tookie is relaxed as his moment of liberty approaches. Photo by Ilse Diaz. 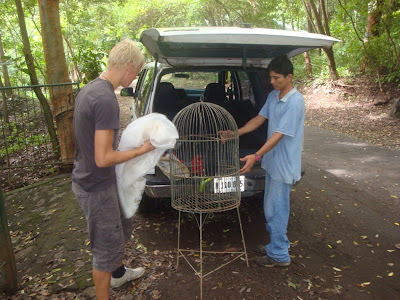 What is humane treatment for a wild animal that is caught and then conscripted to the pet trade? The new Law for the Protection and Welfare of Domestic and Domesticated Wild Animals is not completely clear. What is clear is that all animals must be treated with dignity and their welfare must be prioritized. We argue that wild animals which do not easily domesticate should remain in the wild. and whenever possible, should be re-integrated into wild habitat. 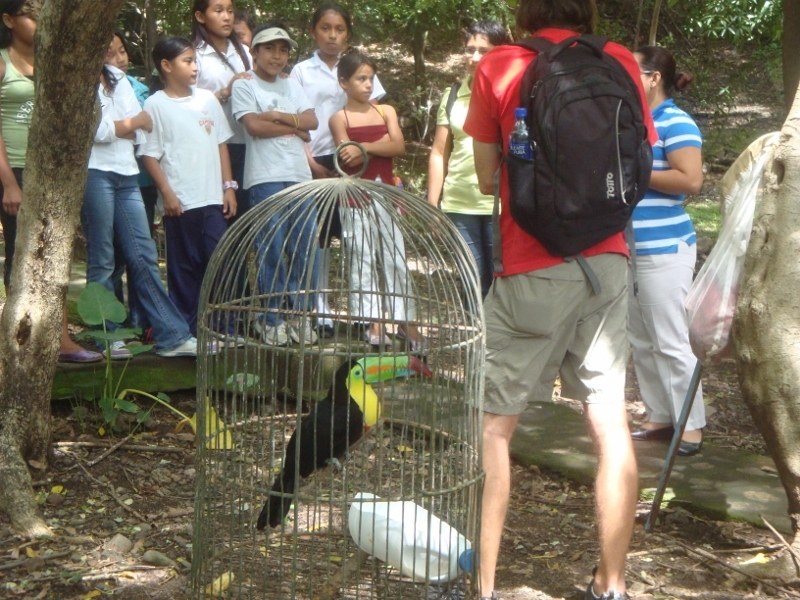 Representatives of the Public Interest Defense office and the Ministry of Natural Resources discuss the event with the young people before Tookie is set free. Photo by Ilse Diaz. Obviously, not all people here agree with us. 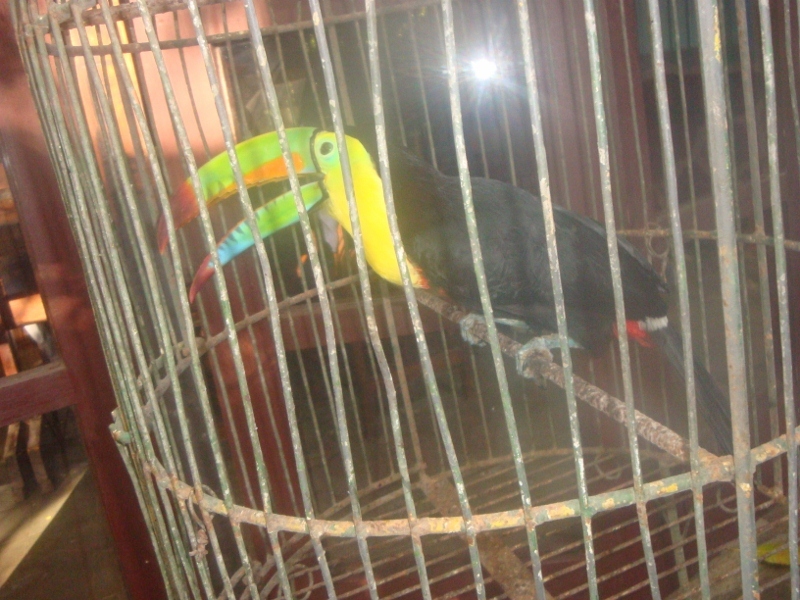 Many homes in Nicaragua have monkeys, macaws, and even wild felines in cages and on chains. None of these animals are ever happy in cramped quarters, without the freedom to move and interact with other animals in the way their ancestors did for thousands of years. Will we have to wait until the last toucan in Nicaragua is in a cage? Jeffrey explains how Tookie was once a pet and now will be able to return to the wild, from which he came. Photo by Ilse Diaz. Lots of folks have come by Estacion Biologica Laguna de Apoyo in the past several months and they have seen Tookie in his relatively ample enclosure. Commonly, the visitors would ask to take him, instead of having us let him go into the wild. Tookie is beautiful and naturally, we want to acquire him. But Tookie is not an object, he is a live animal, a sentient being, and he needs to be where he is happiest. Tookie looks very calm after being transported to the liberation site. Photo by Gordon Evans. Tookie likes people. He is comfortable with people near him. We were concerned whether he would fly away or whether he would seek us and stay nearby. Jeffrey removes Tookie from his cage and prepares to let him fly. Photo by Gordon Evans. But he flew immediately and sought a limb to perch. From about eight meters up, he slowly gathered in all around him, both at his level and above. The canopy remained far above, reaching some twenty meters height. He never looked down again. After several minutes, he flew again, this time further upward, where he stayed another half hour. Eventually, Tookie was gone in the forest of Laguna de Apoyo Nature Reserve. Tookie's first perch after being set free. Photo by Gordon Evans. The participants in his liberation all watched intently, wondering if he would return. He was glorious, high in the trees, with his bright beak clearly visible. He remained near enough for us to watch, but he never looked down upon us again. His sights were set for the jungle! Tookie is observed as he adapts to his new home in the forest. Photo by Gordon Evans. Tookie has demonstrated clearly to all of us that wildlife can be returned to its natural habitat, given a number of conditions are met. Tookie today is living with other toucans where he deserves to live and die. 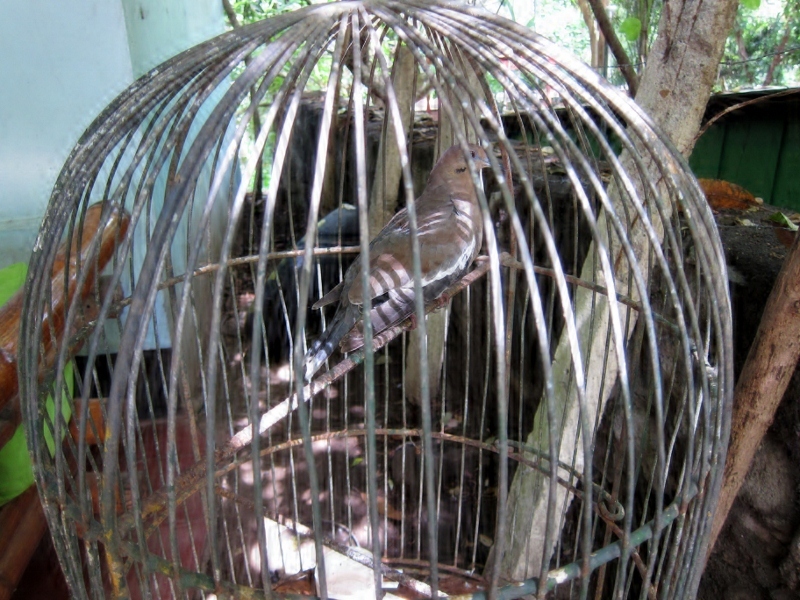 The wild animal pet trade has been extremely damaging to wildlife populations in Nicaragua. We can respond to their threat by confiscating animals that should not be allowed in captivity, and in some cases, we can prepare them and then release them back to the wild. 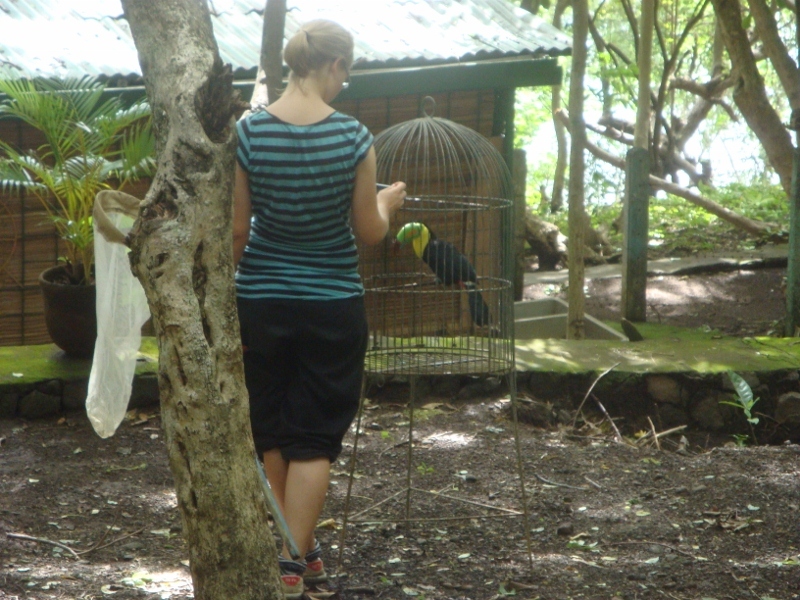 Would you like to help us rehabilitate wild animals? Please contact us if you have time to volunteer or resources to donate. All kinds of things are welcome, from money, to food (dog food works for lots of animals), to office supplies, old computers, and even old pet cages. 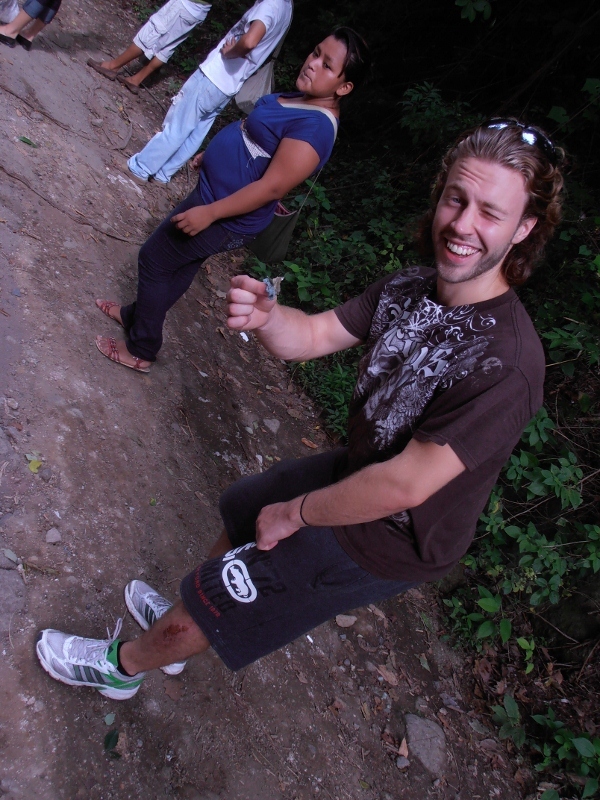 Lots of wild animals in Nicaragua suffer from casual threats such as boys with slingshots. 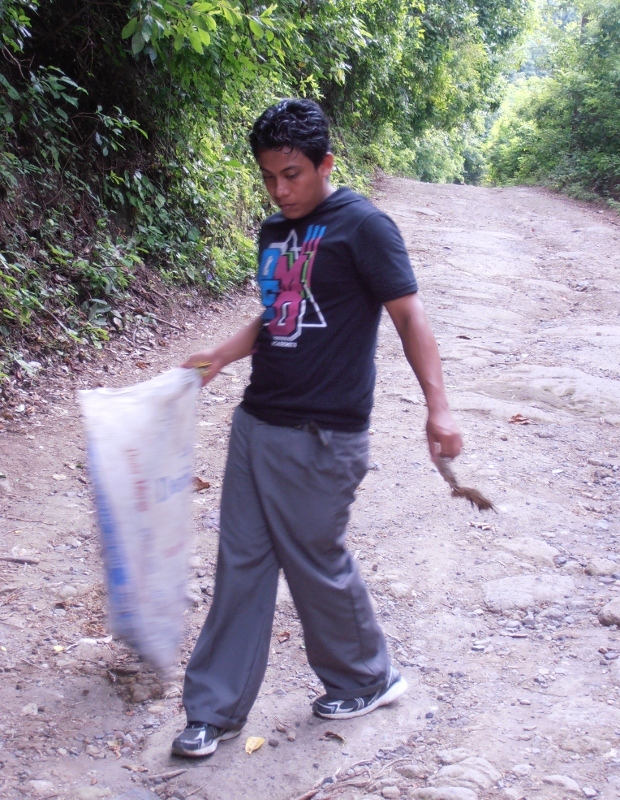 Almost all Nicaraguan boys carry slingshots and use them whenever they see an animal within reach. This pastime kills wildlife but even more wildlife manage to escape with injuries which weaken the animals and leave them as easy prey for others. Our rangers at Laguna de Apoyo Nature Reserve exercise the prohibition on slingshots, but their work is not easy, because this protected area is within walking distance of thousands of people on all sides. This White-winged Dove suffers from an injured right wing. Photo by Pablo Somarriba. There are many special animals, rare and endangered in our area. 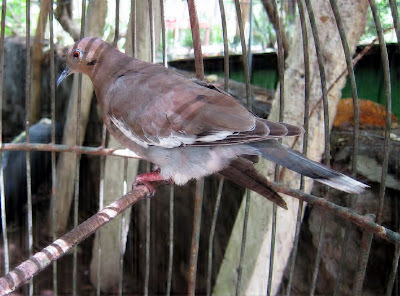 The White-winged Dove (Zenaida asiatica), however, is not one of them. 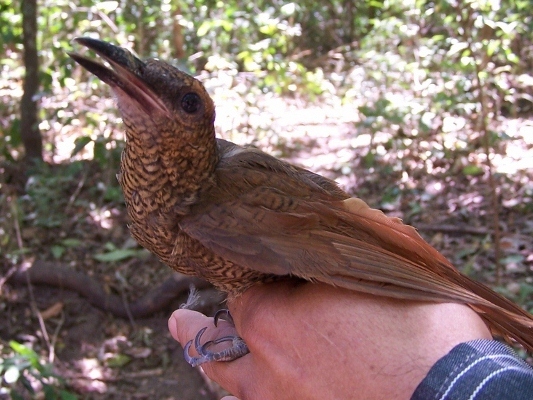 It is among the more common of the birds in the Pacific region of Nicaragua. It is common in areas with sparse trees, inside cities and even in deserts. But as a wild animal, it deserves to live and die in its natural setting. And up close, it is a beautiful bird! 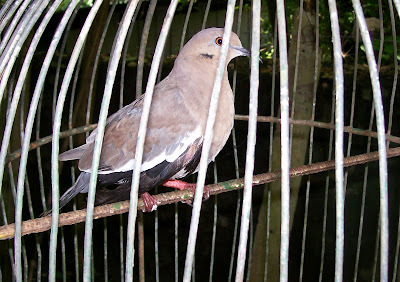 This White-winged Dove took months to recover from an injury caused by a slingshot, but it eventually recovered and flew away. Photo by Pablo Somarriba. Taking care of wounded wildlife is frustratingly difficult. Many animals die, without any apparent reason. 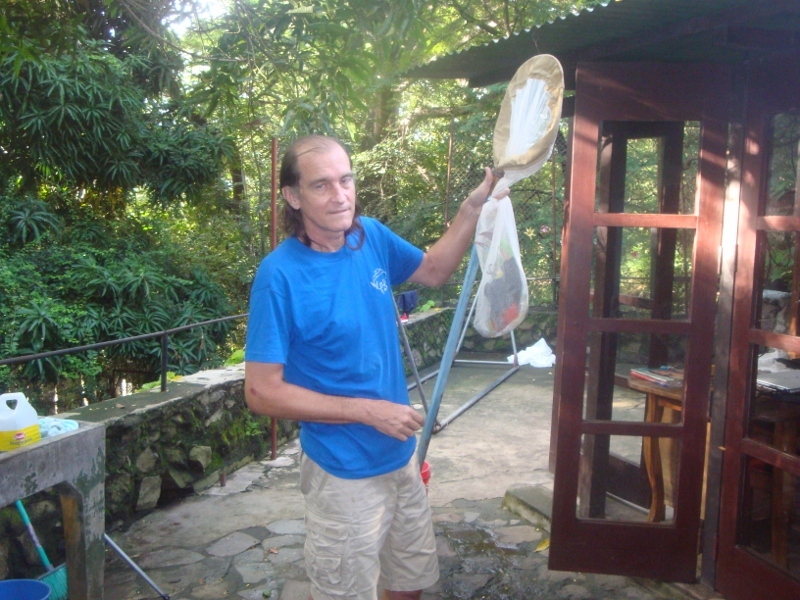 We kept him almost two months at Estacion Biologica Laguna de Apoyo. This bird was accompanied by another brought to us from Masaya, but the second bird succumbed to its injuries. Sometimes, we have successes, though; this bird eventually recovered and flew away to live once again in the forest. The White-winged Dove heals from its injuries-victim of a slingshot. Photo by Jeffrey McCrary. The White-winged Dove was content enough in the cage, but he deserved to return to the wild, if he could. After a few months, his wing was healed enough to fly. We released him, and children of the local school watched as he flew away! Feeding and caring for rescued wildlife is not simple, and sometimes it is costly. Would you like to volunteer or donate to our wildlife rescue project? Please write us if you would. Building cosciousness in the young people of Nicaragua. International Coastal Cleanup Day 2012.. Photo by Dennis van der Woude. Most visitors to Nicaragua note two things immediately. The people are friendly and the trash is ubiquitous. The sides of roads throughout the cities and countryside alike are coated with plasic bags and soda bottles. Nicaragua, like most of the third world, is unprepared for the modern conveniences of the developed world. Rather than just complain about it, we have set about to improve things here, starting with our own backyard, Laguna de Apoyo Nature Reserve. 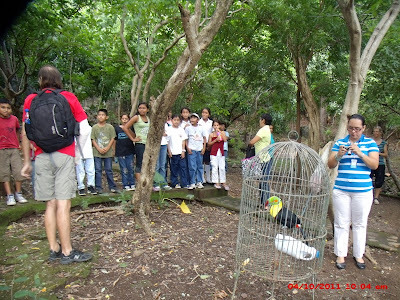 Students from our local high school, Colegio Jose Augusto Silva, assemble at Estacion Biologica for indications before cleaning up their designated area. Photo by Gordon Evans. The International Coastal Cleanup Day is celebrated in Nicaragua to help us focus on what challenges we face along the shores of our rivers, lakes, and oceans. Once the trash enters the water, we may not even notice the disasters it continues to cause. Our abundant beaches should stay clean for us and for all the aquatic wildlife that did not ask for their homes to be polluted. Of course, plenty of the trash goes onto the water. The fish must make their lives around our beer cans and junk food wrappers. We also periodically organize underwater trash cleanups, too. We found lots of trash, filling dozens of bags. Photo by Dennis van der Woude. 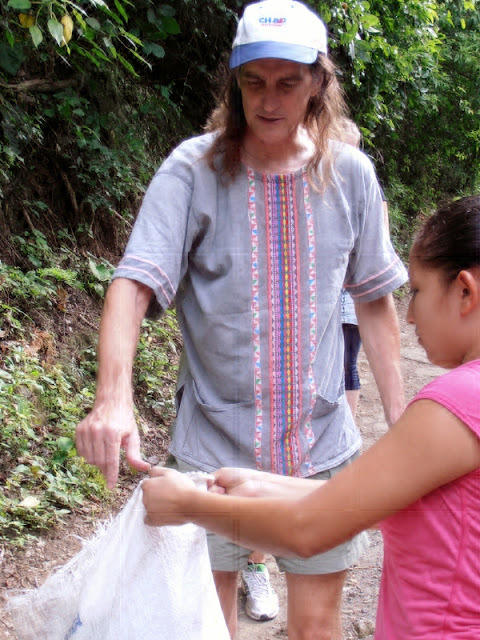 The International Coastal Cleanup in Laguna de Apoyo Nature Reserve resulted in hundreds of pounds of garbage removed from its shores. Photo by Dennis van der Woude. We don't really like picking up the trash from other people, just so they can drop more in its place. But we do like contributing to activities that change attitudes and situations. 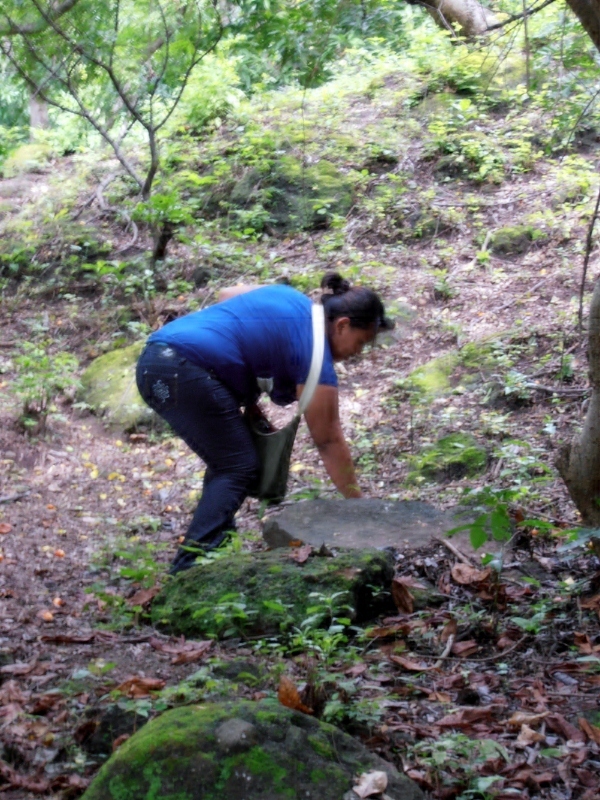 The International Coastal Cleanup gives many Nicaraguans a chance to think that "another Nicaragua" is possible, one without lots of trash everywhere. By involving the government on many levels, more preventative measures regarding trash may be generated. Donald is a teacher at Apoyo Spanish School and a lifelong resident of the Laguna de Apoyo area. He volunteered his free time to help pick up trash. Photo by Dennis van der Woude. 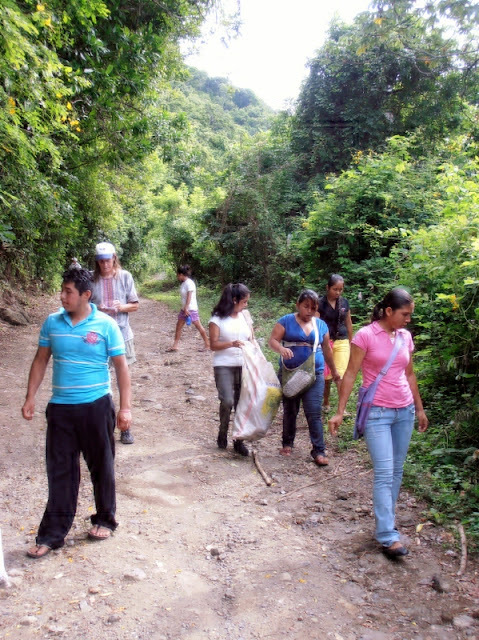 Interns performing projects at Estacion Biologica in Laguna de Apoyo contributed to the cleanup effort. Photo by Dennis van der Woude. Activities such as trash cleanup should be fun and a learning, positive experience. We enjoyed participating, especially because everyone was smiling. We all felt that, by helping to clean up Laguna de Apoyo, we are more a part of this special place, too. We want this lake to be clean and beautiful for the next generation. Trash often finds its way into places where people rarely walk. Photo by Dennis van der Woude. 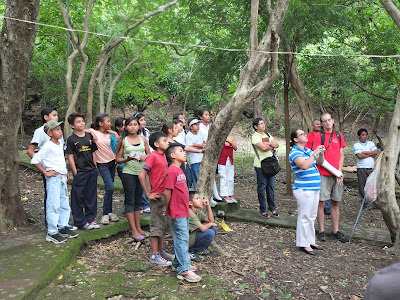 Nicaraguans and foreigners got to cooperate in this experience, too. 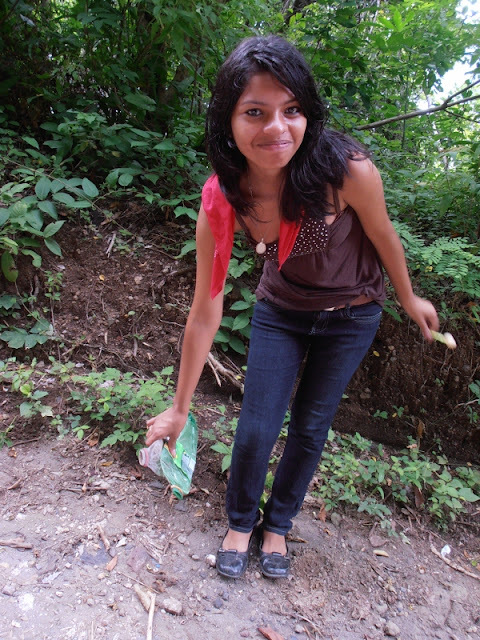 Picking up trash alongside the Nicaraguans was much more interesting than listening to the foreigners complain about the trash everywhere. 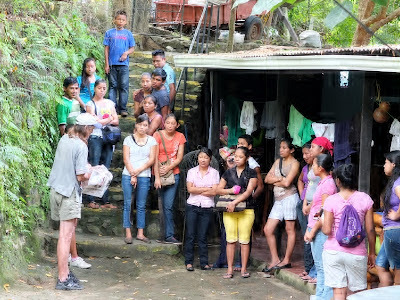 Both Nicaraguans and foreigners have a greater appreciation for Nicaragua and its problems when they work together to make a small contribution to solve them. 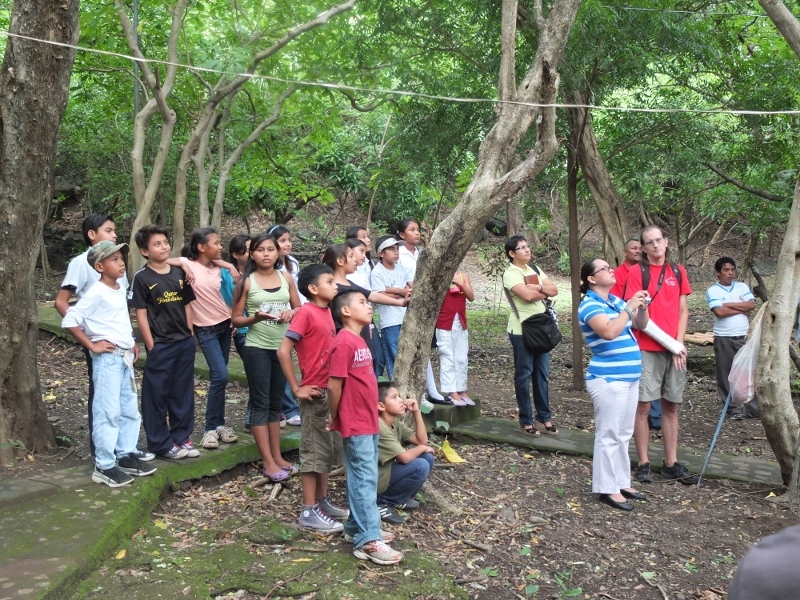 Laguna de Apoyo is fortunate to have students and teachers interested in protecting Laguna de Apoyo. Photo by Dennis van der Woude. 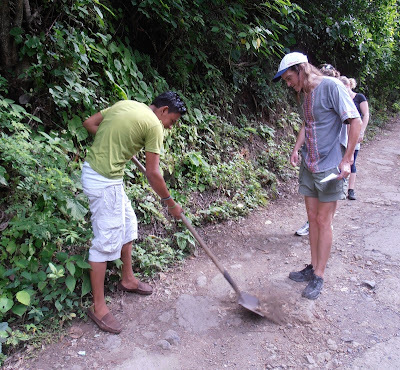 Volunteering in Nicaragua is a great way to travel and experience the country. We always have great activities for volunteers to help with these activities. Would you like to be involved? Please contact us.